The embryonic galaxy named SPT0615-JD existed when the universe was just 500 million years old. Though a few other primitive galaxies have been seen at this early epoch, they have essentially all looked like red dots, given their small size and tremendous distances. However, in this case, the gravitational field of a massive foreground galaxy cluster not only amplified the light from the background galaxy but also smeared the image of it into an arc (about 2 arcseconds long). "No other candidate galaxy has been found at such a great distance that also gives you the spatial information that this arc image does. 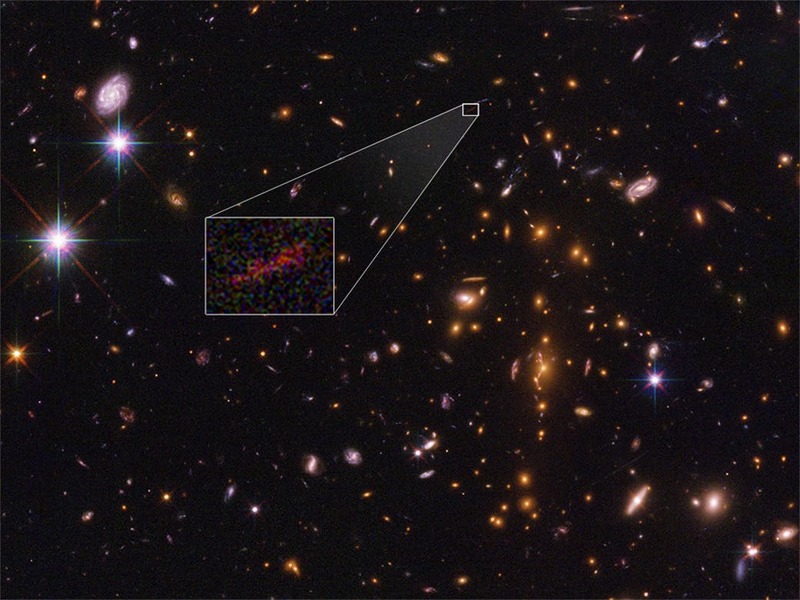 By analyzing the effects of gravitational lensing on the image of this galaxy, we can determine its actual size and shape," said the study's lead author, Brett Salmon of the Space Telescope Science Institute in Baltimore. He is presenting his research at the 231st meeting of the American Astronomical Society in Washington. SPT0615-JD was identified in Hubble's Reionization Lensing Cluster Survey (RELICS) and companion S-RELICS Spitzer program. "RELICS was designed to discover distant galaxies like these that are magnified brightly enough for detailed study," said Dan Coe, principal investigator of RELICS. RELICS observed 41 massive galaxy clusters for the first time in infrared with Hubble to search for such distant lensed galaxies. One of these clusters was SPT-CL J0615-5746, which Salmon analyzed to make this discovery. Upon finding the lens-arc, Salmon thought, "Oh, wow! I think we're on to something!" The galaxy is right at the limits of Hubble's detection capabilities, but just the beginning for the upcoming NASA James Webb Space Telescope's powerful capabilities, said Salmon. "This galaxy is an exciting target for science with the Webb telescope as it offers the unique opportunity for resolving stellar populations in the very early universe." Spectroscopy with Webb will allow for astronomers to study in detail the firestorm of starbirth activity taking place at this early epoch, and resolve its substructure.